Carol Santiago-DeJesus has worked in the East Harlem community for nearly twenty years where she has demonstrated success in developing and operating highly effective workforce development and community social service programs with several nonprofits and currently with El Barrio’s Operation Fightback as its Director of Workforce Development. She attended high school at the Ethel Walker School in Connecticut, earned her undergraduate degree at Columbia University, and is currently pursuing a Master’s Degree at the CUNY School of Professional Studies. 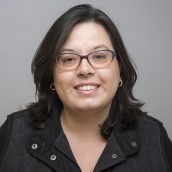 Her certifications include the Family Development Leadership Credential from the University of Connecticut Center for the Study of Culture, Health, and Human Development and the Certificate of Excellence in Nonprofit Leadership jointly awarded by Michigan State University and the Society for Nonprofits. Carol is a member of the New York City Employment and Training Coalition, the National Association of Workforce Development Professionals, and the Society for Nonprofits. She has served on the Board of Trustees for the NYC Autism Charter School since 2009 (where her son is a student), as well as on the Board of Directors for D3 Sports and Rec, Inc., a nonprofit that provides adapted sports and recreational opportunities to children/teens living with autism in the Bronx. Carol was born in Puerto Rico and resides in the Bronx with her husband and two children.